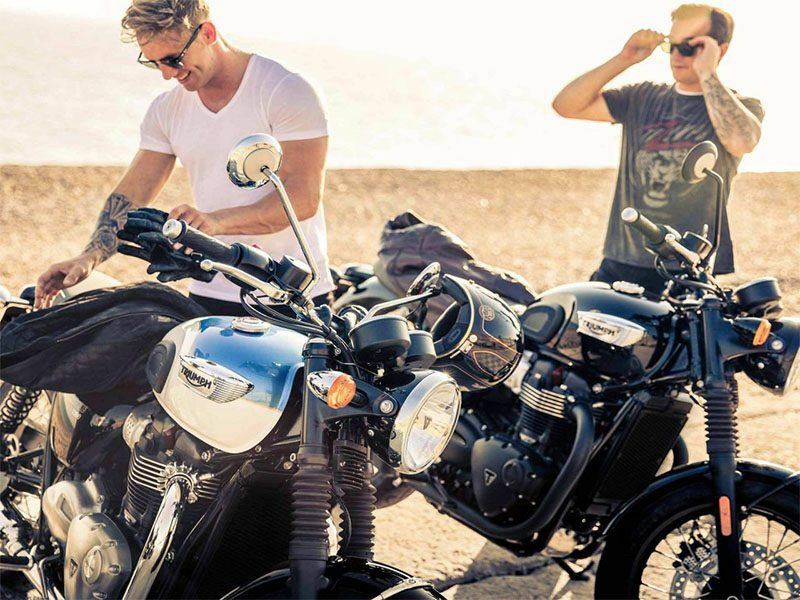 The Bonneville T100 is inspired by the legendary ‘59 Bonneville and has been beautifully designed to incorporate many of the original’s iconic features. The T100 has a wealth of quality finishes, including high-value brushed aluminium engine covers and classic unique bolt-on Triumph badges. Powered by a high torque 900cc engine, the T100 is available to own in three stylish, contemporary colours. SIGNATURE TOUCHES OF A GENUINE ICON: The new Bonneville T100 family stays faithful to the bikes’ evocative heritage and truly iconic motorcycle silhouette, with a sculpted Bonneville signature fuel tank, wire-spoked wheels, authentic ‘peashooter’ silencers and two-tone paint options with hand painted gold coach lines. The T100s' lines are refined, sharp and crafted, with classic yet sophisticated looks. If you like to customise your ride there is also an incredible range of over 150 premium accessories available to allow you to make it your own. ORIGINAL DNA WITH BEAUTIFUL FEATURES: The new Bonneville T100 has a wealth of quality brushed, polished and chromed finishes, including high-value brushed aluminium engine covers and classic bolt-on Triumph badges that are truly unique to the model. The T100 is available in three classic colours. MORE PRESENCE AND STYLE: The T100 Black takes styling to the next level with fully blacked-out details and components for a more moody and sophisticated look. The bikes premium status is complimented by additional styling items such as a twin skin ‘peashooter’ exhaust in matte black finish for a truly distinguished look. The T100 Black comes in two stylish shades. 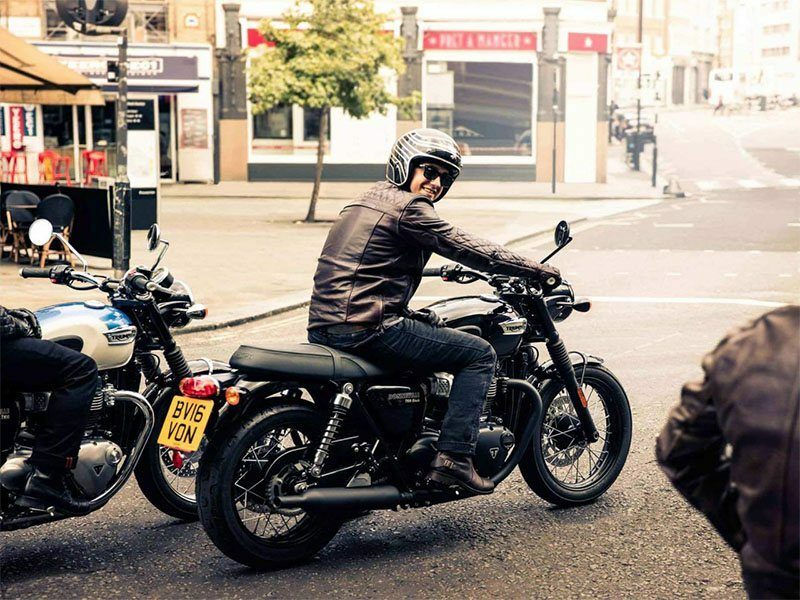 LIGHTER AND EVEN MORE ACCESSIBLE: The Bonneville T100s are one of the most accessible model options in the Bonneville range, weighing in less than the T120s. With a shorter wheelbase, rake and trail then the previous generation, combined with their low seat height, they are ideal for every type of ride and rider. REFINED HANDLING AND COMFORT: The T100s have a significantly enhanced level of comfort and handling. A more comfortable seat with thicker foam comes as standard, and the all new chassis and suspension has been developed specifically for an engaging yet easy-going ride, improving long-distance ride ability and pillion passenger comfort. UPRATED TYRES AND DISC BRAKES The T100s have an uprated single floating front brake disc. Both models come with Pirelli Phantom Sportscomp tyres that have been developed especially by Pirelli for the Triumph Bonneville range. Added stiffness, profile changes to the front and deeper tread on the rear, complement the Bonneville’s style while providing secure handling and excellent durability. 900 CC ‘HIGH-TORQUE’ BONNEVILLE ENGINE: The Bonneville T100s both feature the same specially tuned 900 cc high-torque Bonneville engine that delivers performance where you need it, enhanced fuel economy and a rich, deep exhaust note. The 8 valve single overhead camshaft parallel-twin with 270° firing interval provides smooth, linear power, delivery directly from the slick new five-speed gearbox. MORE POWER AND TORQUE WHERE YOU NEED IT: The 900 cc engine has been designed to deliver much more power and torque where you need it - between 2,750 rpm and 4,750 rpm, to suit the riding style of this modern classic for a more thrilling and engaging ride. The T100 delivers 22% more power in the midrange against previous generations and a massive 18% more peak torque with 80 Nm at a low 3,200 rpm. ELEGANT STYLE AND SOUND: The new Bonneville T100s high-torque 900 cc engine has been elegantly styled with a high level of detailing and finish. It includes signature styling cues from the original 59' Bonneville engine silhouette, whilst incorporating contemporary components sensitively, to preserve the iconic Bonneville look. 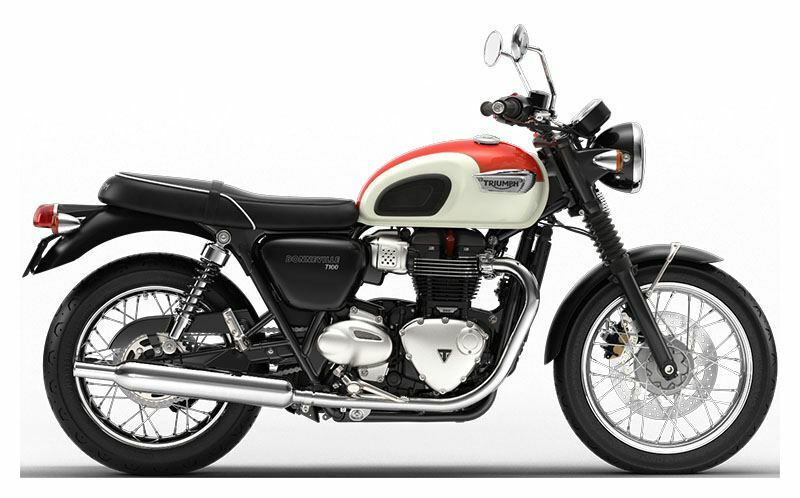 With an elegant ‘peashooter’ style exhaust, the Bonneville T100 delivers the deep rich note of a true British classic. 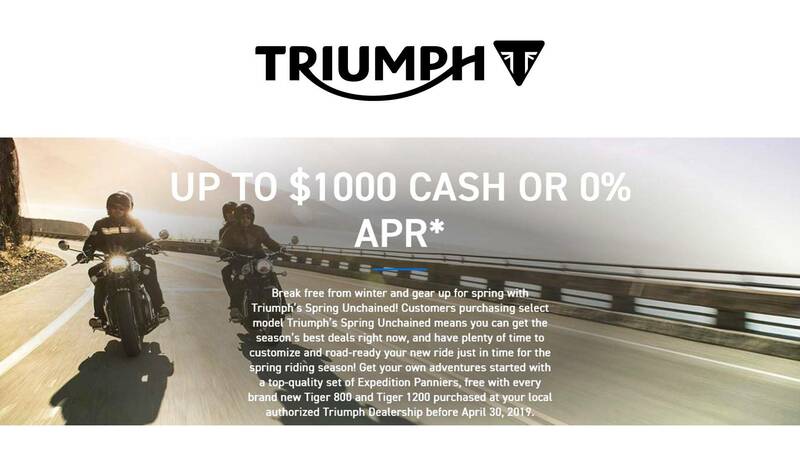 ABS: Triumph's anti-lock braking system brings an advanced level of control and safety to the Bonneville T100 and T100 Black. 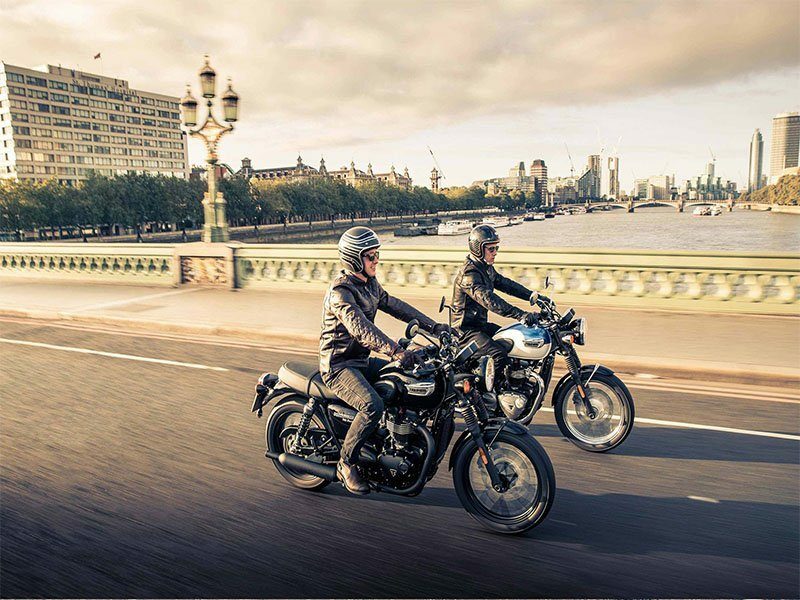 RIDE-BY-WIRE: The Bonneville T100 and T100 Black's electronic ride-by-wire system enhances throttle response, providing smooth and precise drive for a higher level of control, feel and rideability. LIQUID COOLING: The modern liquid cooling system provides better long term durability and more fuel efficient riding with up to 29% better fuel economy than older air cooled models. SWITCHABLE TRACTION CONTROL: Both T100 models incorporate a switchable traction control system that optimises the delivery of torque to maximise rider safety and control. TORQUE ASSIST CLUTCH: The new torque assist clutch system brings a light touch and feel to the clutch control of the Bonneville T100s, helping reduce clutch lever effort for the rider, making it easy to ride, and ride longer. LED REAR LIGHT: The LED rear light has been incorporated into a compact and elegant tail set-up that gives the Bonneville T100 and T100 Black a distinctive light pattern and greater power efficiency for long term durability. ENGINE IMMOBILISER: Both the T100 and T100 Black include a security device that integrates a transponder into the new T100 key, linked to a receiver in the ignition system, to prevent the engine from running without the correct key present. TWIN FEATURE PACKED CLOCK: Both T100s have a stylish feature-packed twin clock (speedo and rev counter), neatly housing a digital menu system, accessed by a handlebar mounted scroll button. Key features include: gear position indicator, odometer, two trip settings, service indicator, range to empty, fuel level, average and current MPG, clock plus access to turn off traction control features. Rear - Wire 32-spoke – steel rims, 18 x 4.25 in. Display and Functions - LCD multi-functional instrument pack with analogue speedometer, analogue tachometer, odometer, gear position indicator, fuel gauge, range to empty indication, service indicator, clock, 2x trip, average & current fuel consumption display, traction control status display, throttle mode status display, heated grip status (accessory) and cruise control ready - controlled by a handlebar mounted scroll button (accessory).